Are you ready to light your fire of excellence? It’s time. Women are seeking a stronger voice in the material handling industry. MHEDA and MHI are partnering to present the first ever Women in Industry Conference. This dynamic event is designed for women who want to fire up their leadership and communications skills, connect with other women in the industry and maximize multiple learning opportunities offered in one-action packed day. Here are 7 ways the Women In Industry Conference will improve your leadership skills. 1. Learn how your peers manage industry challenges. 2. Discover ways to communicate more effectively. 3. Reveal 25 distinct differences in how men and women think. 4. Improve your non-verbal communication skills. 5. Discuss modern trends in HR. 6. Uncover tips for business development in the digital world. 7. Quiet your inner critic and acknowledge your potential. In addition to the knowledge gained, you will also have the unique opportunity to meet other women who work in material handling businesses and face similar daily challenges. Just like you, these women all have a story to tell. Together we will share experiences and life lessons learned. For full information on speakers, education sessions and networking events download the Women In Industry Conference Brochure. theWit Hotel is located in the heart of Chicago with world-class retailers lining the streets outside of the hotel with over 500 shops and 300 eateries found on nearby Michigan Avenue. 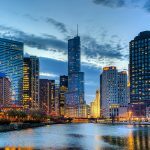 End your Conference experience with a networking reception at theWit Hotel and relax with your industry colleagues by enjoying drinks, appetizers and stunning views of Chicago. Register today and get ready to conquer Tomorrow!